The field of contenders for at-large Boston City Council seats is more diverse than ever this year. Can a new generation of talent -- that identifies with Obama’s message of collaboration and consensus -- have an impact in one of the few large Northern cities that has never had a black mayor? Two blocks from Boston City Hall, the high-powered women gathered in a conference room for the monthly meeting of the Massachusetts Women’s Political Caucus, which backs female candidates for political office. A new year was just beginning, the odd-numbered 2009, so there would be less political action with no regular state elections scheduled. The discussion turned to municipal races. Bolling had more than a vague hope. She suggested that a board member who was present, Ayanna Pressley, then an aide to Senator John Kerry, would make a tremendous candidate. The room erupted in cheers. The response was a measure of its esteem for Pressley, a seasoned congressional staffer who on her own time has helped train female and minority candidates. At the time of that January meeting, she was still three months away from deciding to become a candidate herself for the first time. There was also a shared consciousness of the potential significance if Pressley won. Only nine women have served on the council, which currently has a single female member, Maureen Feeney. The last woman to hold an at-large seat, Maura Hennigan, departed to wage an unsuccessful campaign against Menino four years ago. Ferriabough Bolling, who like Pressley is African-American, was thinking about race, too. A woman of color has never been elected to the council. And it’s been nearly two decades since an African-American held an at-large seat. That was Bruce Bolling, Ferriabough Bolling’s husband. Less obvious was an age issue. At 35, Pressley belongs to a rising generation that has come to occupy nearly half of the council’s 13 seats. Aspiring African-American members of Generation X, though, have had less success breaking into Boston politics. Of the nine black elected officials who represent the city, including Governor Deval Patrick, only one -- state Representative Linda Dorcena Forry -- is a Generation Xer. Their median age is 60; nearly half were born before the late 1940s, which was early in the baby boom, 1946 to 1964; Gen X began in 1965. Chuck Turner, at 69, is the oldest member of the City Council. State Representative Willie Mae Allen, 72, is the eldest of the 22 legislators who represent Boston on Beacon Hill. So, as Pressley contemplated stepping out from behind the scenes, her decision appeared to lie at the tricky intersection of gender, race, and generation. Like President Barack Obama and Governor Patrick, Pressley has planned to let race, and her gender, be obvious facts that for the most part speak for themselves. The large field vying for the four at-large seats (elected citywide, rather than by a specific district), including those held by a pair of white incumbents, has shaped up as the most diverse ever. Fifteen candidates have made the ballot, from a rainbow of races and ethnicities: Six are black, two are Latino, and one is Vietnamese-American. Pressley is the only woman in the race. She is, though, leery of the campaign’s devolving into a competition based on race and ethnicity or gender. Generation is another matter. Pressley says she does see herself as a representative of Generation X. The combination of age and race has unleashed some tensions within the city’s African-American community, though she describes her own relations with older black elected officials as positive. When you talk to African-Americans who are politically oriented but belong to various generations, some differences in outlook and methods do become apparent. At the same time, the distinctions among them are not bright, unyielding lines. “I look at our elected officials, and I see they are graying,” says Ferriabough Bolling, herself a baby boomer. “Not that there’s anything against graying. 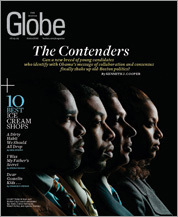 But to me there’s a need to cultivate a new generation of elected officials.” Some elders wonder, though, if the upstarts have the persistence to get elected or the will to expand what has been limited political opportunity for African-Americans in Boston, one of the few large Northern cities, along with Indianapolis and Milwaukee, that have never elected a mayor of color. None of the city’s older black officials are projected as serious contenders for mayor at any point. It may fall to the Generation Xers to do what their predecessors could not -- capture the mayor’s office and thereby update the city’s image, which in black communities around the country remains stuck in the bygone era of open racial hostility. Ayanna Pressley, a Chicago native who moved to the city in 1992 to attend Boston University, sees herself as a representative of her generation. A tall woman with a polished professional manner, she echoes some of her contemporaries’ themes and reflects some of the same attributes. Yet she has managed to keep away from any intergenerational tensions, in part because as a staffer first to Joseph P. Kennedy 2d when he was in Congress and then to Kerry from 1996 until this May, she has not posed a political threat. “I’ve enjoyed a mentoring relationship and a positive relationship with all of the black elected officials,” Pressley says. Black elected officials, and other politically active members of older generations, appear to respect the depth of her experience and effectiveness as a congressional aide, which landed her a senior position the last four years as Kerry’s political director. At a Back Bay fund-raiser for City Council President Mike Ross in April, Gloria Fox, one of four African-American women serving in the Massachusetts Legislature, privately estimated Pressley’s chances of winning an at-large seat as better than many other contenders because of the prospect of women rallying behind her. What’s more, Fox said, she wanted to meet with Pressley to share some campaigning tips. Born after the Civil Rights Act of 1964, Generation X is the first in the nation’s history whose African-Americans have had the whole range of professions open to them. Many have found fulfillment in the corporate world and have stayed out of politics, coming of age as they did at a time of polarizing, vilifying partisanship. At least until the last couple of election cycles, black Generation Xers actively engaged in politics have been a rarity. It’s striking how many of the city’s young black candidates have prepped for campaigns by being government professionals, specifically, aides to legislators. Pressley and Ezedi, who was a staffer for Representative Michael Capuano, have worked for members of Congress. Onetime legislative candidate Emmanuel Bellegarde was an aide to state Senator Jack Hart. Carlos Henriquez, who is challenging Turner for a second time, worked for Flaherty on the City Council. Today’s young candidates would not be the first to follow the path from aide to elected official. But boomers and their elders are more likely to see being a community organizer -- or activist, as the role was called pre-Obama -- as the most legitimizing platform for seeking elected office. “One of the things we benefited from was the civil rights movement,” says former councilor Bruce Bolling, 64. “Significant efforts at community organizing -- it was expected. This last generation has not had that experience. I think it has made it more difficult to be connected at the grass roots.” Culpepper, a boomer, argues that working on behalf of “the little man” is a prerequisite for successful candidates seeking election in a black community that has always had more than its share of poverty. “I think you have to have the activist and advocacy experience to connect with the community,” he says. The resumes of some young candidates do reflect grass-roots connections. Henriquez was a council aide but has also been a community activist with the Dudley Street Neighborhood Initiative. He says he learned to be engaged in community affairs from his father, Julio Henriquez. After working for Capuano, Ezedi became director of the Roxbury YMCA. Pressley describes her mother, Sandra Pressley, at one point an Urban League advocate for low-income families in Chicago, as a community organizer who believes in the power of government. “My mother informed me that the way to be a change agent to create change, the first line of defense, or however you want to phrase that, is politics and government,” Pressley says. The youthful challenges to the black incumbents amount to a classic Young Turks versus the Old Guard. By generation, the city’s nine black officeholders are almost evenly split between the “silent generation,” born before the end of World War II, and the baby boomers. Then there is Forry from Generation X. That age distribution tilts older than national black leadership -- the Congressional Black Caucus is comparatively younger. Of the 41 African-Americans in Congress, nearly 60 percent are boomers, about 30 percent are from the silent generation, with the rest from Generation X. The intergenerational tensions in the city’s black politics have been unfolding for at least a decade. They have played out almost exclusively in the losing campaigns of Generation Xers against older candidates, most but not all of them incumbents. One factor has been the limited upward mobility of black officeholders into statewide or congressional posts. Perhaps as a result, incumbents have done little to groom potential successors. In 1999, business consultant Scotland Willis ran for an open council seat representing Roxbury, a seat won then and held since by Turner, whom federal prosecutors last fall charged with bribery. (State Senator Dianne Wilkerson, a boomer, resigned in November after being accused of similar federal charges.) Willis, now 42, is trying for an at-large seat this time around. Two years ago, Henriquez, of African-American and Latino descent, lost badly to Turner. The son of Sandra Henriquez, an assistant secretary of housing and urban development in the Obama administration, Carlos Henriquez is mounting another challenge. He’s 32. The generational conflict burst into the open in 2003, when Ezedi, who had just left Capuano’s staff, waged an aggressive campaign against Yancey in Dorchester. At that point, Yancey, the longest-serving African-American on the council, was finishing two decades in office. Ezedi accused him of neglecting his duty to ensure that basic city services flowed to his district; the councilor’s supporters cast his opponent as the handpicked candidate of Yancey’s white adversaries at City Hall, Menino and Flaherty. The veteran bested the newcomer handily and still chafes at what he considers the unduly favorable media coverage accorded his challenger. This year, Ezedi, 36, is campaigning for an at-large seat and portrays himself as a unifying candidate. “I look for opportunities for partnership and collaboration. I’m a uniter.” The irony is he sounds like two black officeholders not of his generation: Obama and Patrick, both boomers. Greenidge and Bates also talk about the need for a system to hold black officeholders accountable -- a subtle way of suggesting their performance hasn’t been up to par. The Black Political Task Force, which was formed in the early 1980s, used to play that role, interviewing candidates, endorsing them, and then working the polls on their behalf. In recent years, the task force has lapsed into inactivity. Younger critics of Yancey’s and Turner’s performance may be overestimating the limited powers of Boston city councilors. The case may be stronger against members of the Legislature, where seniority counts. Elected in the early 1980s, Representatives Byron Rushing and Gloria Fox are beloved in their districts, but they are hardly known as legislative powerhouses, though Rushing, the only African-American man who represents Boston in the Legislature, is an assistant majority whip. Last summer, Ferriabough Bolling led an intergenerational discussion about politics, sponsored by Greenidge’s Black College Alliance. When she asked Generation Xers present what was stopping their peers from getting into politics, several indicated a sense of frustration and resignation after a couple of losing efforts. They mentioned, she said, Ezedi’s 2003 campaign against Yancey and Bellegarde’s in 2005 for the legislative seat that former House speaker Tom Finneran vacated in Mattapan and Milton. The veteran political consultant advised them that first-time candidates can’t be expected to win, especially against a longtime incumbent like Yancey. She might have also noted that another Generation Xer, Forry, won the seat that Bellegarde, then 28, did not. Bellegarde has since moved to Washington, D.C., where he works for Mayor Adrian Fenty, an African-American of his generation, tending to constituent services in one of the capital’s wards. Across generational lines, there is agreement that political elders have not done enough to groom younger prospects for office. Though that was not its stated purpose, the Black Political Task Force had once filled that role. Yancey, for instance, was its president a year before winning his council seat. Bates speaks of the need for a thoughtful “legacy transfer” from senior officeholders to young aspirants. Creating a body similar to the task force has been proposed in the intergenerational discussions, which resumed recently. For the first time, black candidates for at-large council seats are stacked up, though it remains to be seen how many make it past the September 22 preliminary, which will winnow the field to eight for the November 3 election. If elected, Pressley would be the first African-American woman on the council. Ezedi would be the first with African immigrant roots (his father is Nigerian). The other African-Americans in the citywide race are Scotland Willis, Robert Fortes and Tito Jackson, all Generation Xers. Jean-Claude Sanon, a boomer, would be the first of Haitian descent. Pressley appears determined to position herself as a broad-based candidate, infrequently speaking of herself in terms of race or gender during a series of interviews over two months. She talked about the importance of relationships of the sort she has cultivated around the city as Kerry’s political director and as a volunteer on the boards of civic and youth organizations. “When I hear politics, I hear relationships,” she says. When asked about the classic advice from political consultants to candidates to solidify their base first, Pressley gives a skeptical roll of her eyes. Kenneth J. Cooper, who shared a Pulitzer Prize for writing about race in Boston for the Globe, is a freelance writer in Boston. Send comments to kenjcooper@verizon.net.